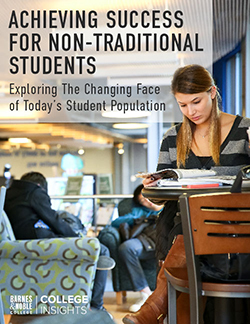 Who is Generation Z (Gen Z), what are their unique characteristics, and how should college and university administrators adapt to best meet the needs of this newest demographic to arrive on campus? Barnes & Noble College Insights recently conducted a monumental study on Gen Z, those born between 1995 and 2000, focused on students in middle-school and high-school. Referred to as The Sharing Generation, All Technology All the Time, and Born Digital, Gen Z could not be more different than previous generations. They bring their own set of new attributes and experiences to higher education. For example, almost half (49%) of older teens (16-18 years old) have already taken a class for college credit. As Gen Z begins to develop their thoughts and feelings about the world around them, we’re beginning to get a glimpse of the next wave of college students—and how they differ from Millennials. Find out what we’ve learned and how Gen Z will change the future of higher education, and potentially, the world. 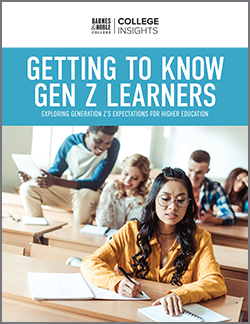 To download a copy of Barnes & Noble College’s Getting to Know Gen Z: Exploring Middle and Higher Schoolers’ Expectations for Higher Education, click here.